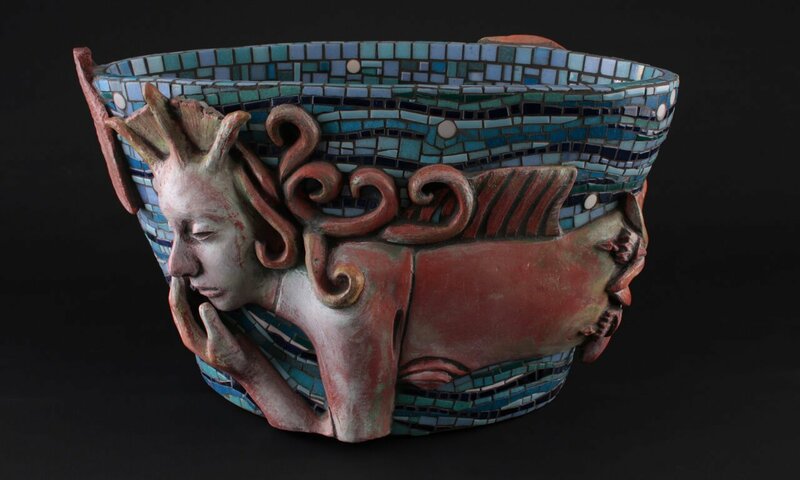 The creations of 13 ceramic artists will be featured in a nine-week show entitled "Earth: Vessel," at Concordia University Wisconsin's Art Gallery, 12800 North Lake Shore Drive, Mequon. “Ceramics is one of the world’s most ancient art forms,” noted Gallery Director Dr. Theresa Kenney, “and has held our stories for generations in images and pictographs.” Works by Jessica Laub, Ann Mory Wydeven, Ty Bender, Kevin Pearson, Jean Smaglik Wells, Diane Evans, John Bowers, Michele Vento, Andrew Linderman, Liz Lewandowski, Reid Schoonover, Peter Froehlic and Jeff Shawhan will be on display January 28-March 31. “Through this exhibition, visitors will be able to experience a bright and varied conversation with clay,” added Kenney, a professor of art at Concordia. Shawhan creates a majority of his decorative and functional ceramic pieces using the raku-fired method, a harsh cooling process that results in intense color and patterns. The associate professor’s work is represented in numerous corporate collections, including Northwestern Mutual Life Insurance and Harley Davidson in downtown Milwaukee. Lewandowski and Froehlic are CUW alumni. During the same time frame, illustrations by Peggy McDowell will be shown in Concordia’s 14 Frames Gallery in a show entitled, “Half Glue Gun Will Travel: Domestic Divas.” Wesley Schiek, a freshman Art major, will display a series of small sketchbook drawings in the new Student Gallery January 28-February 3. A collaborative exhibition of works by Concordia University Wisconsin and Milwaukee Institute of Art & Design Interior Architecture and Design majors will take center stage in that gallery February 4-March 31. Founded over 30 years ago to educate, challenge and inspire the campus community by bringing in excellent contemporary and historical art, the gallery is free and open Monday-Thursday from 4-8 p.m., and Friday and Sunday from 12-4 p.m.
For more information on the gallery or any of the upcoming shows, call Kenney at 262-243-4509, or e-mail her at theresa.kenney@cuw.edu.